This three year collaborative project, funded by The Leverhulme Trust, brings together specialists working on different countries affected by the First World War to examine the impact of food shortages on European and Ottoman societies during the conflict. It considers both the causes and the consequences of reduced food supplies in various regions of the continent. 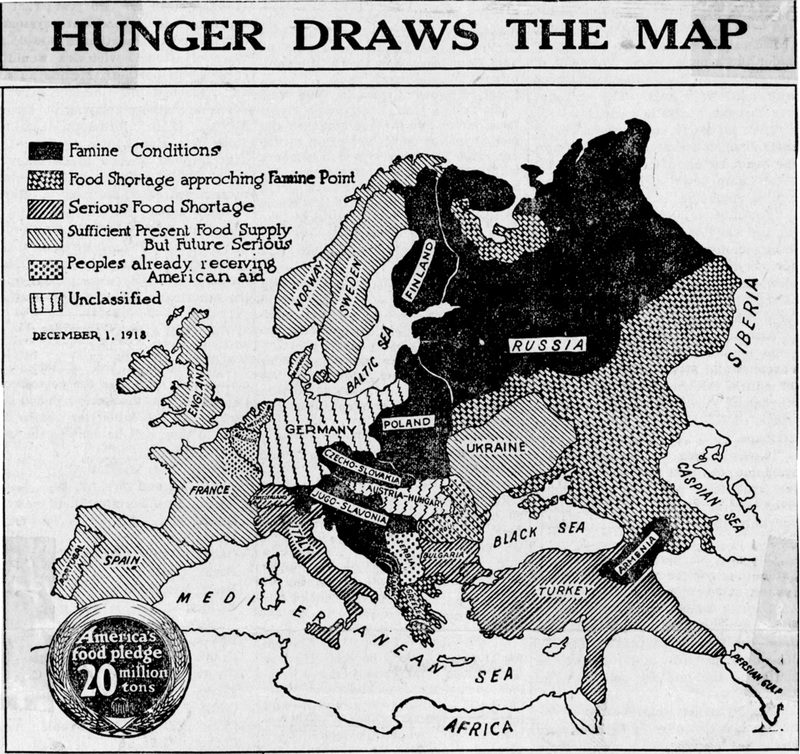 Our goal is to compare levels of hunger and responses to it during and immediately after the war across the continent. Local studies on hunger during the war exist but a truly transnational project will provide a much more global picture of the phenomenon. Hoover Institution Library and Archives, used with permission. Our project started in January 2016 and will run until the end of December 2018. A series of workshops and conferences will enable our network partners to plan the research findings, share methodologies, and disseminate results. A monograph on the core, transnational themes related to hunger in this era is being written by members of the Hunger Draws the Map network, and will be co-edited by Dr Mary Cox and Dr Claire Morelon. The book will be complemented by this website, which is aimed to highlight our research and provide a venue to display our forthcoming interactive maps. The institutions involved in the network – University of Oxford, Regensburg University, University of Amsterdam, The Hoover Institution Library and Archives, Stanford University, Pennsylvania State University, University of Helsinki, Georgetown University, University of Latvia, University of Zurich, and the University of Groningen – complement each other well, as they provide strong support in diverse areas related to our research. At an institutional level, we are particularly pleased to have the support of the Hoover Institution, with its rich and unique archival collection that contains primary sources on hunger and living standards. For these reasons, Hoover was a natural venue for our most recent network conference on hunger during the war. Our second collaborative project workshop ran from 5-7 April 2017 and was graciously hosted by one of our partners, the Hoover Institution at Stanford University. More details about this event can be found on Hoover's website, here.